Below is a letter from Plaifa, another one of the students we help support. It has obviously been a busy time! During the last semester break, my aunt and my cousin visited me at Chiang Mai. So I had a chance to go visit several places, Royal Park Rajapruek, Wat Phrathat Doi Suthep, and Mae Ya Waterfall. Then the semester break ended soon after that. Currently, I am studying in the Secondary School Year 4, Classroom 401, in ‘Science, Mathematics, Technology and Environment Special Classroom Project’. There are more subjects to study and much more activities than that of the Secondary School Year 3. 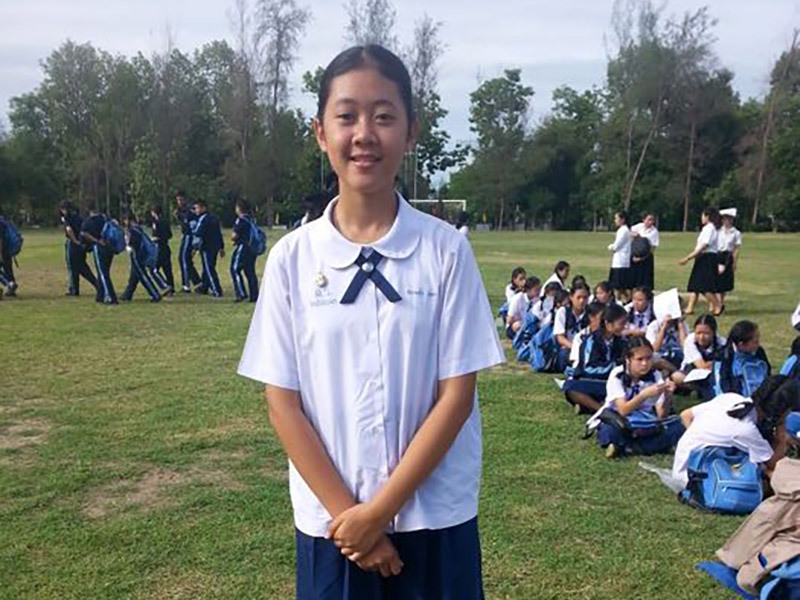 Recently, I attended the orientation of the Science, Mathematics, Technology and Environment Project of the northern part of the northern region of Thailand at Yupparaj Wittayalai School with my classmates. A teacher told us about his experience when he decided to choose the Physics Program to study. I had a chance to do the activities and I went to visit the Computer Science Program, Faculty of Science, Chiang Mai University. I have learned about the projects of the undergraduate students such as Sensor and Voice Command Using Sensor. During Songkran, the Songkran festival held at my village was not so big. Every year the people in my village will go to the temple making merit and bathing the Relics of the Buddhist Monks to pay respect in the afternoon. The people will bring the water bathed to the Relics back home believing that it will bring good fortune to them. In the evening on the same day, my parents brought me to pour water to the elderly’s hands to pay them respect at their house. My family will do like this every year during Songkran. Although my village’s festival was not quite big, they had one of the most popular Songkran festival in Thailand held at the downtown area of Chiang Mai. Now at my school, the final exam is coming soon. I am starting to prepare for it. Now I am reading books such as general knowledge, academic books, and fictions. Now that I am studying in the Secondary School Year 4, I think the difficult subjects for me that I do not quite understand clearly are Computer (C Language) and Chemistry because there is a vast content of knowledge in each subject to understand and memorize. So I need time to study more than other subjects. But I will try my best. At last, I would like to thank you, my scholarship donor, for granting me this scholarship. I promise that I will make the most out of it.